Asbury Technical Institute has produced 36 techs who were hired into Asbury stores so far. ATLANTA -- While some dealers scream about technician shortages, Asbury Automotive Group is trying to plug those gaps by training more of its techs in-house. The public dealership group launched Asbury Technical Institute last year in a former dealership in suburban Atlanta. So far, the school has produced 36 techs who were hired into jobs at Asbury stores. Another 25 or so are expected to graduate this year. The school is expected to help Asbury reach its goal of adding between 200 and 400 technicians in the next couple of years. "These students are moving right back into our stores and adding value in a relatively short period of time, so we just think it's a win-win for everybody," Asbury CEO Craig Monaghan told Automotive News. Technicians themselves were the impetus for the school. Some Asbury master techs approaching retirement told executives they'd like to stay with the company in teaching roles. At the time, Asbury was moving an Audi dealership to a new site, which freed up the service department space at the old store. The first class of 12 technicians graduated in September, just in time to start filling open positions at Asbury's Atlanta-area Nalley dealerships. "We're always on the edge of having enough technicians," said Ryland Owen, Asbury regional director of training and recruiting. The volume of work in Asbury's service departments grew during the recession, and that has continued, Owen said. At the same time, the repair industry has suffered from a decline in people interested in becoming technicians, creating bottlenecks for dealerships. "You combine all these forces, and we realized we were coming to a point where we just can't plain do enough work for customers and meet their needs and grow our business unless we have enough technicians," Owen said. "And we're faced with a general lack of technicians in the marketplace. Corporate decided let's make an investment here." Asbury declined to say how much it has spent on the institute. The available space meant capital costs were relatively low, but it's still a significant investment. Asbury pays the students a $12 hourly wage for 40 hours a week during their 12-week training. The retailer gives each of them a $5,000 tool set upon graduation. Graduates must agree to work at Asbury for at least a year. So far, four have left early, including one for health reasons. That's still less than Owen expected, based on industry norms for beginner techs. Anyone leaving early must return the tools and pay a prorated amount of the training costs. The students are a mix of ages and backgrounds. About 20 percent come from jobs at Asbury stores -- porters or car washers looking to move up, for instance, Owen said. Others are referred by Asbury employees, often friends or relatives, or answer ads that Asbury posts on the Internet. Students have ranged in age from 18 to mid-40s. 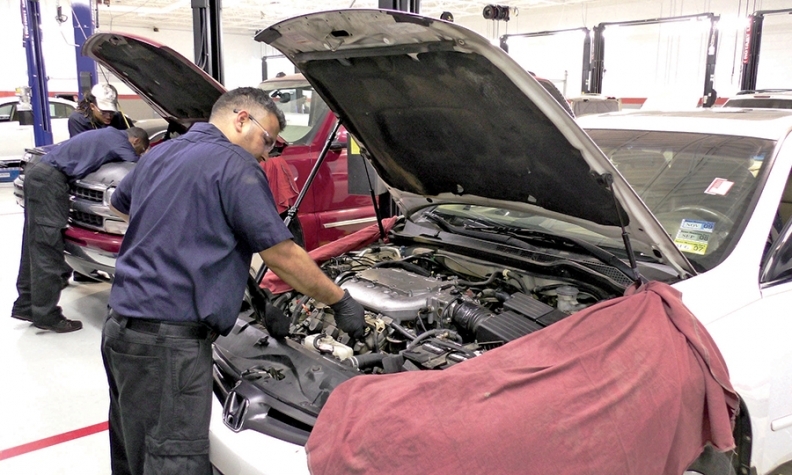 Most have some exposure to auto repair, even if only through high school auto shop classes. About two-thirds of school time is spent doing hands-on, in-shop training, and the rest is classroom instruction. The school graduates a class every four months. Upon graduation, students become entry-level technicians, but they do more than just oil changes, Owen said. "These are people who will go to a store and do basic maintenance," he said. Asbury will consider adding schools in other markets if the Atlanta center continues to perform well, Monaghan said. The company has locations in North Carolina and Florida that could be candidates, Owen said. For graduates, the training continues on the job at the dealership, and wages can increase swiftly. Jonathan Hambrick, 24, graduated from the program last fall and began working at Nalley BMW of Decatur. He now makes $18 an hour and recently bought his first house. Hambrick had worked as a mechanic before but had no formal training. He was referred to the program by a friend who works at a Nalley Infiniti store. The tool set and the job guarantee appealed to Hambrick, who said he probably wouldn't have gone back to mechanic work without the program. "I had such a bad experience," Hambrick said. "I had worked at two mom-and-pop shops in the past. In the dealership setting, there's a lot more give and take and more understanding, more professionalism, more laid-out guidelines of what you're supposed to do." He's doing a full range of jobs at the BMW store. "When I first came out of tech school, it was straight into the fire," Hambrick said. "So far, it's worked out."